This project is taking shape. Okay, so I have chosen a dress for the October Dress Project, and it is breastfeeding-friendly. It's also maternity, which is a bit... bleh... but it actually looks quite nice without the bump. It *is* a tad longer in the front than the back without the extra tummy, but I really had trouble finding a dress with a neckline suitable for breastfeeding! My friend Heather, who is also going to do it, picked out her dress today too. 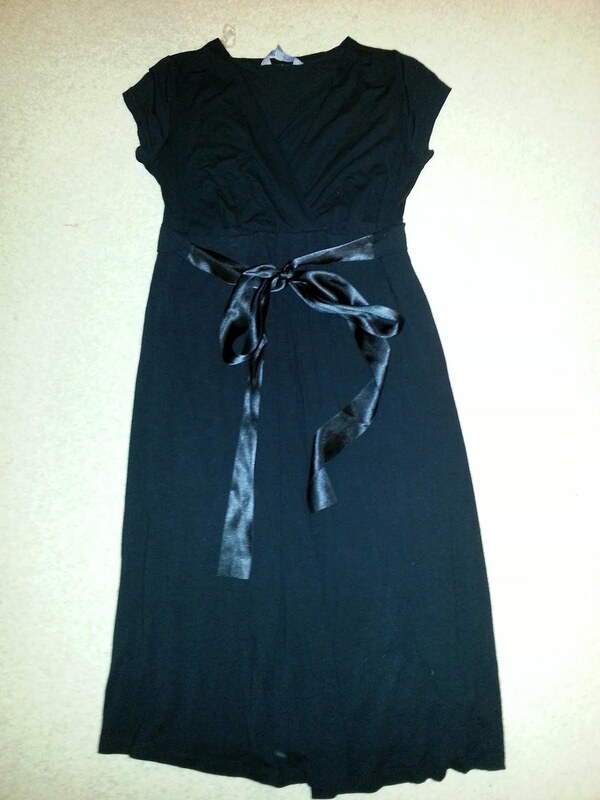 We're hitting the charity shops tomorrow to look for inexpensive accessories to liven up our little black dresses. We are trying to convince as many people as possible to join us and take on 31 sponsors each. We could make a seriously good amount of money for local cancer support if we put our minds to it! Today, I spoke to the local representative for Macmillan Cancer Support to get the correct information for how to give them money, as well as to make sure Macmillan is happy for us to endorse them. Everything is looking good, just waiting for the final confirmation so that we can take this next to the Greenock Telegraph. I have written the following Press Release which I'll send to the paper tomorrow (once I've been 'approved' or whatever). Anyone else doing something similar, feel free to use the same wording. I am assuming that the founders of ODP will not mind that I used one or two of their phrases from their website. A small group of women in Inverclyde, each with ties to friends battling cancer, are raising money for cancer support during the month of October. An unusual and different way of fundraising, the women are taking part in a challenge called the October Dress Project (octoberdressproject.blogspot.co.uk). For one month, they will each wear only one dress every day (and wash it at night! ), which can be daily accessorised differently, learning a little about simplicity and materialism along the way. The project was inspired a few years ago when the founder’s grandfather made the offhand comment that girls in his day wore 'one dress for weekdays and one dress for Sunday'. The project’s motto is ‘anti-consumerism, pro-simplicity, anti-conformity, pro-imagination’ - but for this group, learning to appreciate the value and potential of a single quality garment wasn’t the only motivation for accepting the challenge. They felt they could use this opportunity to do something for the greater good and raise money for local cancer support at the same time. Each participant will try to get 31 sponsors, one for each day of the month, to donate to the Macmillan Cancer Support team in Inverclyde. They are also hoping to inspire many more people in Inverclyde to take part in the October Dress Project this month, to give each other ideas, get more sponsorship, and raise even more money for this great local charity. The more people involved, the better! Does it have to be a dress? This project doesn’t have to be limited to women. If you are a man, or if your job limits your ability to wear a dress, why not try a single pair of trousers and shirt for the month? If you are interested in participating, please contact Lori McFarlane (lori.weehoneybee@gmail.com) for a sponsorship form. We (okay, Heather) have already gotten several local businesses to sponsor us, and I have about a third of my sponsorship form already filled in. I'm getting so excited about this. I hope we can get a lot of people involved!